Instead of the usual conversion to 12 volt, I was asked if I could convert a couple of mid-fifties 12V trafficators for use on a six volt Seven. Seemingly, I needed to magic up some extra power from nowhere. Actually, it turned out to be easier than might have been thought. Bear with me for a very brief technical bit. The trafficator arm is lifted by a solenoid pulling on a plunger. 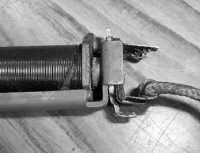 The solenoid is just a coil of wire on an iron former, which is magnetised when current flows through the wire. The amount of pull is related to the amount of current and the number of turns of wire – actually measured in “Amp turns”. The normal winding is one coil of 1000 turns of wire, (nine layers each of 110 turns – yes I counted them!) and takes two amps – thus 2000 “Amp turns”. So, I needed 2000 Amp turns from only six volts. I worked out that if I made a coil using only half the length of wire, then I’d still draw two amps from a six volt battery. But this would only have 500 turns, hence a pull of 1000 Amp turns. The answer is to use the rest of the wire to form a second coil wound over the top. Now I have two coils, each drawing two amps and each pulling 1000 amp turns, giving a total of 2000. Back where we started! The first step is to get the coil out of the trafficator using controlled violence. Firstly, the tiny little catch spring and catch pin are disconnected and removed, allowing the arm to be disconnected from the plunger. Next, the rivet that anchors the top of the coil former is cut off using a Dremell – this’ll be replaced later by a cut down 6BA countersunk screw. The coil connection to the terminal plate can be cut, (be careful not to cut the wire that powers the bulb), leaving a stump for connecting back up later. Then, by prising gently between the coil former and the anchor plate, the coil can be lifted free, and the plunger removed. Whilst it is in bits, treat it to a cleanup with some thinners, being careful not to attack the orange arm or the coil windings. Now comes the fiddly bit. Using a mandrel, a lump of steel in a hand drill, I carefully unwound four layers of the copper wire, being careful not to kink it as I needed it later. To save it, I spooled it onto a plastic tub, but anything would do. I unwound four layers rather than four and a half as the inner layers are smaller and therefore have less wire length – the outer four layers equals about half the overall copper wire and therefore about half the resistance. Note: if you damage the wire in the process, it will need replacing. It is ~25SWG enamelled covered copper, 20 thou (0.5 mm) thick...and not too easy to source – so be careful! Having unwound the four layers, cut through the wire leaving enough tail to be able to connect back to the terminal pad. Next, start a new coil IN THE SAME DIRECTION AS THE ONE THAT HAS JUST BEEN REMOVED, starting at the end furthest from the new cut tail. This is important: if you wind it the other way the magnets will cancel each other out, not add together! 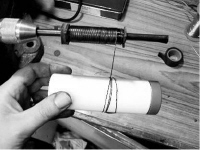 Using the hand-drill and applying a gentle tension, the wire can be rewound back onto the coil. It is very important to wind this neatly as there isn’t room for an overweight sausage of wire – it has to go back in the space it took up before. Wind on all four layers, but leave a long enough tail to reach the terminal pad. When this is finished, cover the windings with a single layer of masking tape, just to stop the new coil springing off. 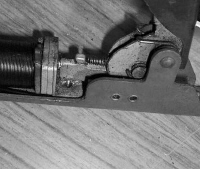 You should have a coil with one tail near the rivet hole, (the top when fitted to the car) and two tails where the anchor plate is swaged in (at the bottom). Now it is ready for reassembly. As the Haynes manual states: assembly is the reverse procedure! 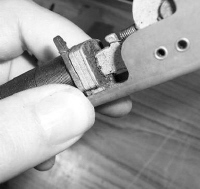 Fit the plunger into the coil, push the assembly back onto the swaged portion at the bottom of the indicator, and replace the rivet with the 6BA screw. Note that you’ll need a solder tag under the nut: scrape off a little enamel and solder the tail to it as you reassemble. When done, add a drop of Loctite to stop it vibrating loose. At the terminal plate end, sleeve off the two tails, scrape off just enough enamel and solder both tails onto the stump cut off earlier. Use the sleeving to prevent chafing between the copper wire and the main structure of the trafficator. Finally, refit the catch pin, ensuring that the little spring fits onto the plunger. Treat the moving parts to a little 3-in-1, (not 20:50!) and the job's done. This article, written by Geoff Hardman, originally appeared in CA7C Seven Focus in Feb 2006 pp17-19.